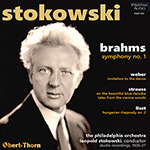 This release, commemorating the 135th anniversary of Leopold Stokowski’s birth (18 April 1882) as well as the 40th year since his death, is the first in a series which will reissue his recordings of the four Brahms symphonies with the Philadelphia Orchestra. Made over a span of six years (1927 – 1933), they were the first integral set of the works offered on disc. Brahms’s First Symphony was something of a calling card for Stokowski throughout his career. It featured on his debut program with the London Symphony Orchestra in 1912, and later that year was the main work at his first concert with the Philadelphia Orchestra. He recorded it commercially five times, more than any other Brahms symphony. The 1927 performance presented here, the first electrical recording of any Brahms symphony, was prefaced by a spoken outline of themes by Stokowski. As with his contemporaneous recording of the Beethoven Seventh (reissued on Pristine PASC 483), Stokowski plays selected illustrations on the piano. Probably because the conductor tended to turn away from the microphone while still speaking in order to play his excerpts, later such recordings used Philadelphia assistant conductors Artur Rodzinski and Sylvan Levin at the keyboard. Stokowski had recorded the Weber Invitation to the Dance earlier in a cut acoustic version (PASC 192) using Weingartner’s arrangement. For his first electrical recording of the work, he chose the more familiar Berlioz orchestration, but added to it some of his own touches such as having the solo exchanges in the opening played by the entire cello section, and distributing some of the “replies” to the oboe in addition to Berlioz’ clarinet and flute. The final work on our program, Liszt’s Second Hungarian Rhapsody, was a favorite Stokowski “lollipop” which became progressively more exaggerated over the years (see especially Stokowski’s filmed performance of it in One Hundred Men and a Girl), but never lost its sense of playful fun. The recording heard here shows off the incredible virtuosity of the Philadelphia Orchestra, truly an ensemble which had no superior at the time. The sources for the transfers were pre-war Victor “Z” pressings for all except the Blue Danube, which came from a Victor “Gold” label copy, and Vienna Woods, which came from a vinyl test pressing. The original Brahms symphony sides were plagued with pitch and volume fluctuations, which I have endeavored to correct here.